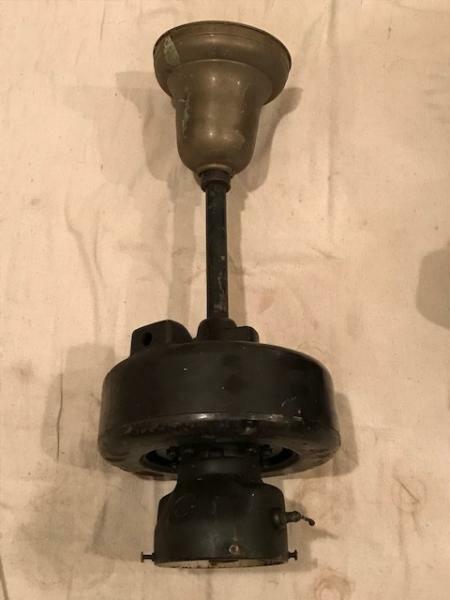 I thought I'd chronicle the restoration of a rather interesting fan; a 1937 Emerson 86641 electrically-reversible "Roundnose" ceiling fan with detachable 4" globe fitter. This fan comes courtesy of AFCA member Louis Weedman. Once restored, I'd like to hang this fan in my breakfast room. 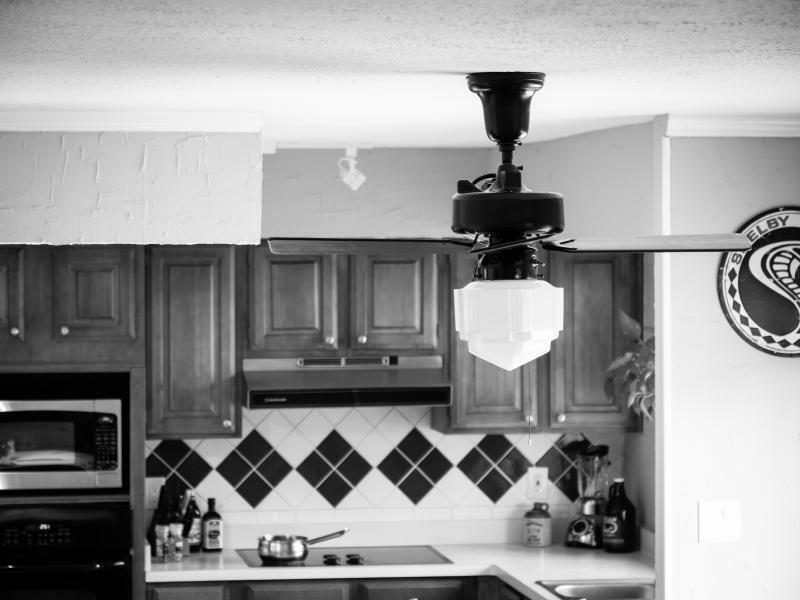 This fan uses a reversible shaded pole motor, with a pair of wound shading poles for each motor pole. The forward or reverse sets of poles are shorted via a SPDT switch to control the direction of rotation. Pretty innovative technology for the time. Here is a "before" shot of the fan. The finish is original but too far gone to save, particularly on the bottom plate where there is some scabby rust. It should at least be easy to strip with just one layer of paint vs. the usual 3 or 4 on a fan of this vintage. Here is the Levolier switch for the reversing function. Unfortunately, it doesn't snap. Also, it is missing the center terminal. 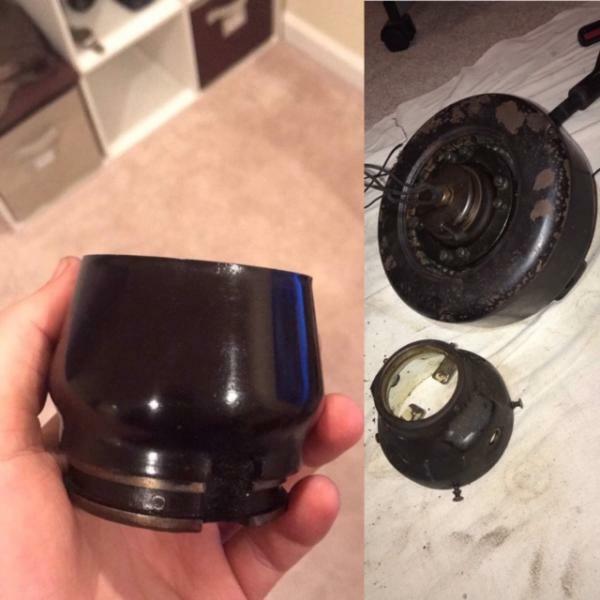 The fan was hardwired for downdraft as found. 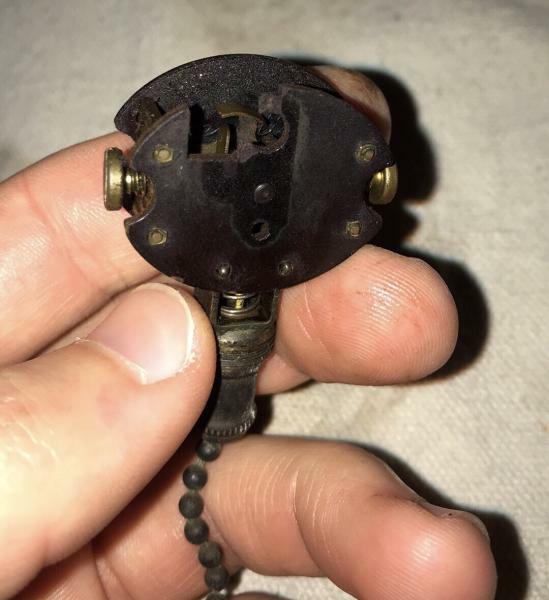 It would be great to track down a replacement, but I've been told that this particular Levolier switch is exceedingly scarce. If I'm unsuccessful, a small SPDT toggle switch will have to suffice. A pic showing the oil cup, sporting very clean original paint. 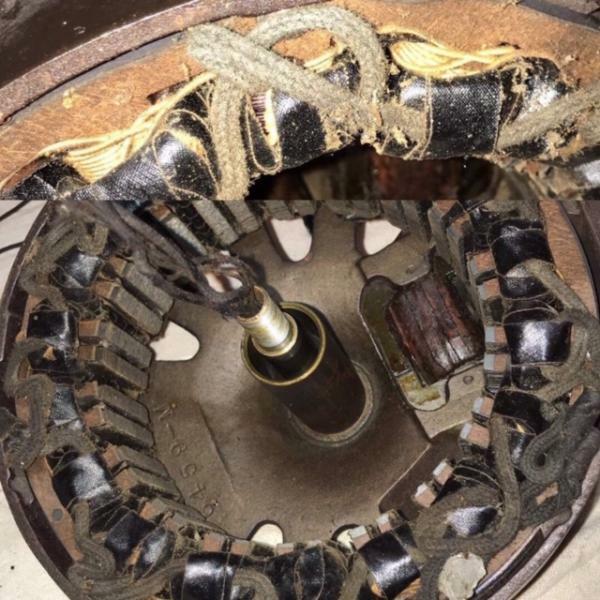 This part is tucked up into the motor, so it has been well-protected for the past 81 years. I'm hoping to match this finish as closely as possible. Rustoleum Dark Brown and Dark Walnut satin spray paint are candidates. 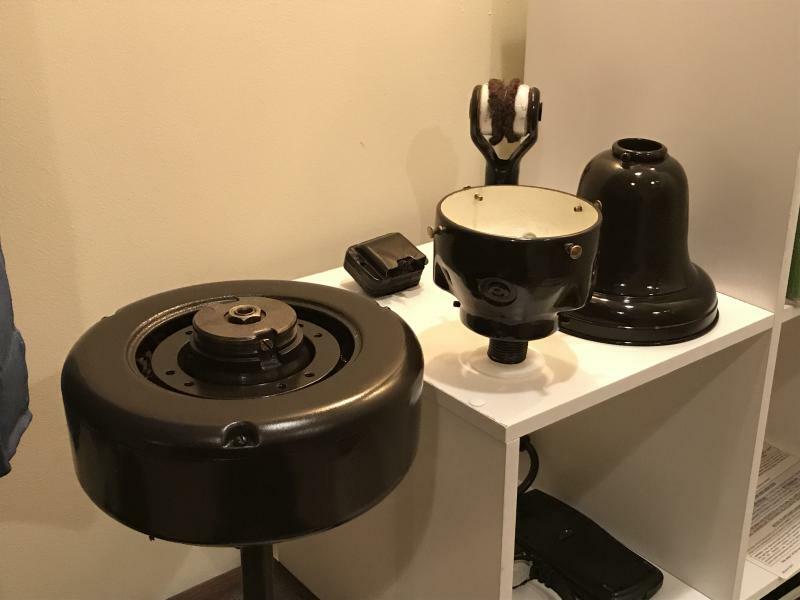 On the right we see the 4" globe fitter. I always admire the clean castings on these old Emersons. With the bottom plate off, we see the motor, jam packed with clean original wiring. I will be working around this wiring, as it is in great condition. We also see the rotor with provisions for reversible rotation. The collared shaft allows two sets of spiral grooves to pump oil upwards for either CW or CCW rotation. 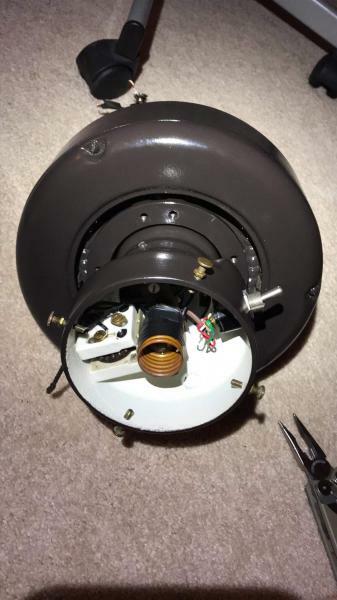 The shaft and bearing are in great shape - this fan should be a smooth runner once finished. 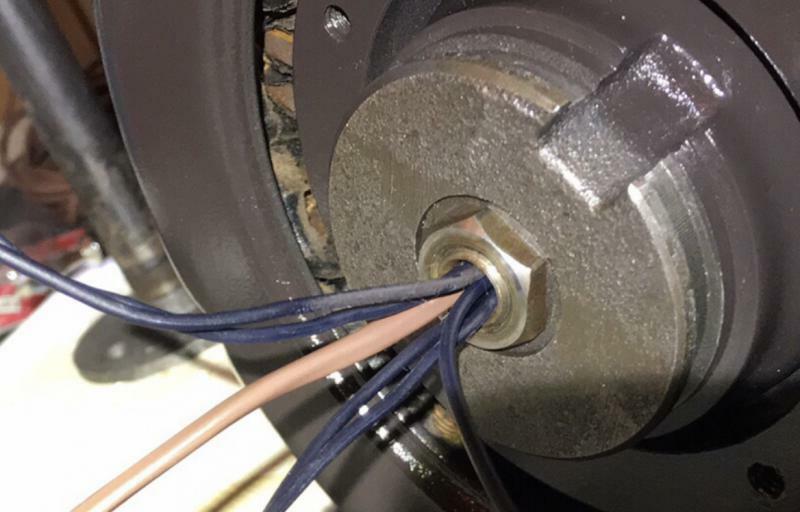 Here we see each pair of wound shading coils tucked inside the main motor windings. These three thin wires travel upwards out of the motor from a cast protrusion and to the main shaft, kept isolated from the power windings. 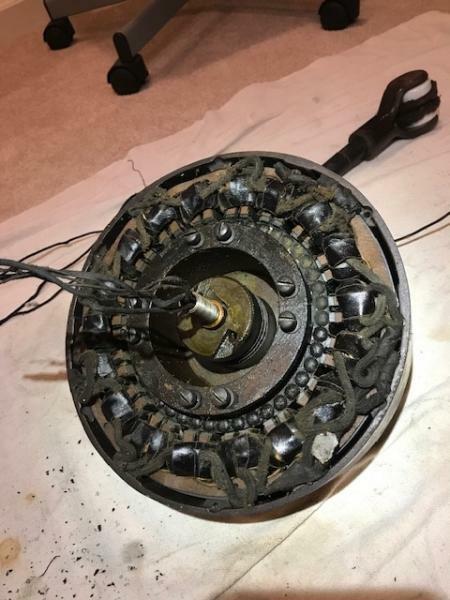 As you can see, the inside of the motor is quite clean. I plan on handling it as little as possible during the restoration. The next step will be stripping the parts one by one. Stay tuned! I think I have your switch. Give me a week or so. Here is a wiring diagram I created for this fan, in case anyone is curious. Update time! I’ve striped, primed, painted and clear coated everything. Just waiting on wire and an SPDT on-on toggle to finish the job. 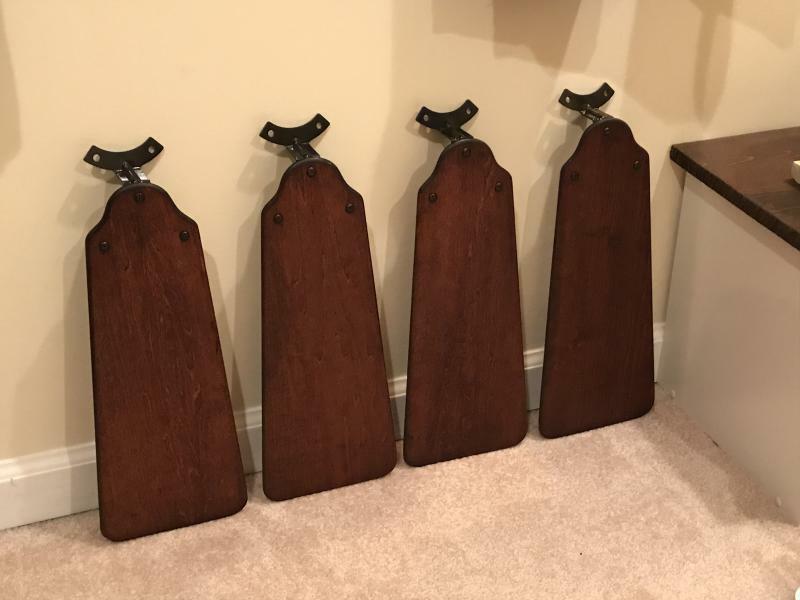 Old English dark woods worked wonders on these blades! Does this fan have a light kit on it? I'm wondering because the nose of the fan looks like it has a place to put a schoolhouse style globe in it for a light. 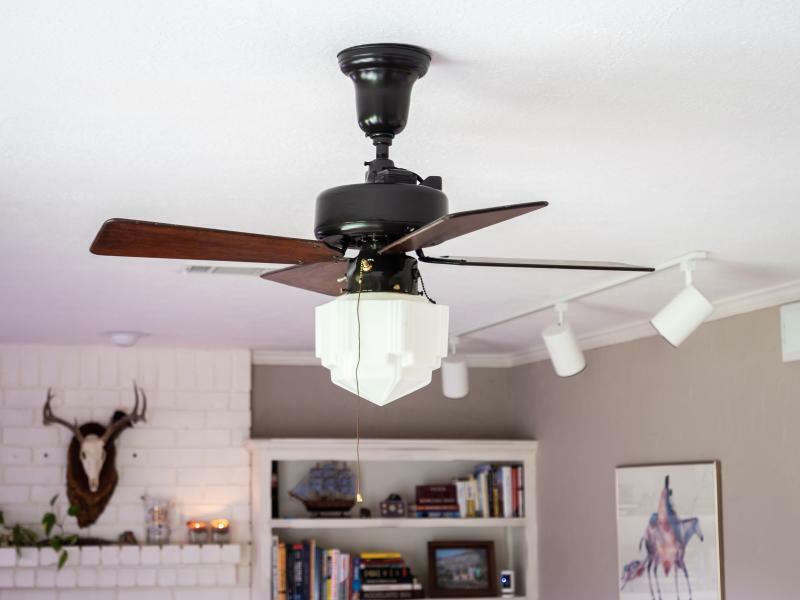 Also they do have simple Off/On pull chain switches like what this fan had on it originally at most of your local hardware stores that you can use for the reverse function on this fan. Levi Mevis wrote: Does this fan have a light kit on it? Yep! It has a 4” fitter. Seen in the first pic. I painted the inside white to better reflect light. So how the the fan turn on and go through the 3 speeds and how does the light turn on? I'm assuming there were pull chain switches for the light and fan power besides for reversing the fan? Levi Mevis wrote: So how the the fan turn on and go through the 3 speeds and how does the light turn on? I'm assuming there were pull chain switches for the light and fan power besides for reversing the fan? 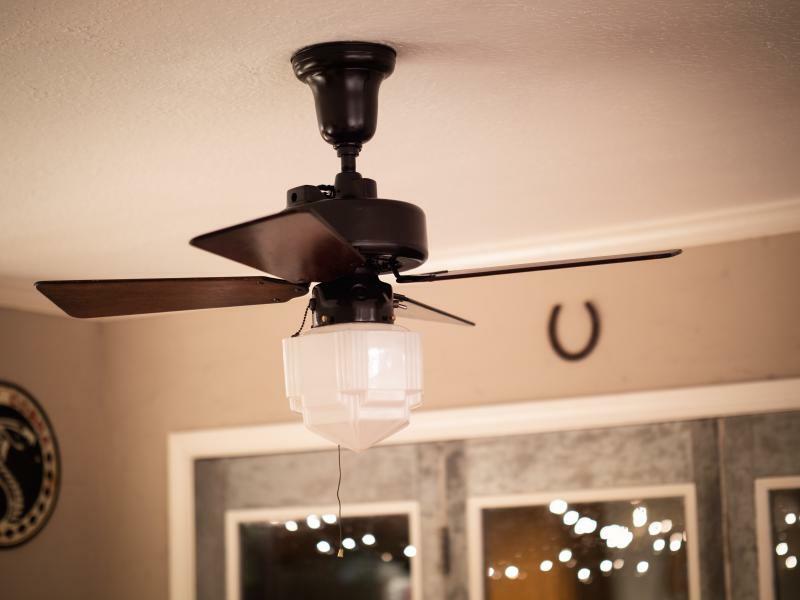 It’s a two-speed fan, controlled though a porcelain Arrow pullchain. Light kit is hardwired but I could add a pullchain to the fitter housing to switch it. 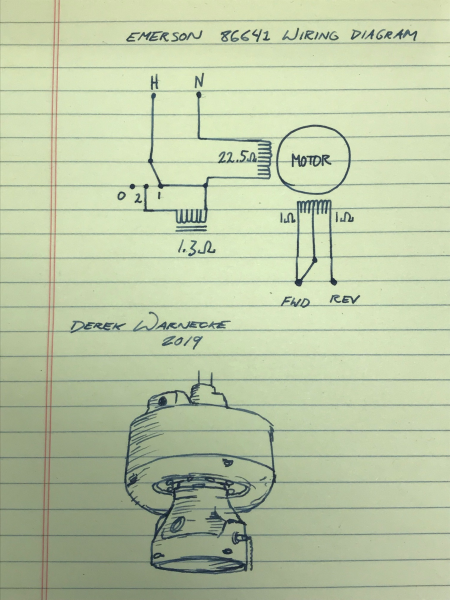 Reverse switch was a SPDT levolier but will be a SPDT toggle due to the extreme scarcity of that Levolier (Original is broken). Finally finished! The wiring job was especially tricky on this fan, with a grand total of 8 wires to pull through the shaft. All connections were soldered and heat-shrunk up top, to the speed coil, stator coils and shaded pole coils. The fan works perfectly, and runs quietly. The rotor takes a full minute to spin down on its own, which is considerably longer than I'm used to seeing on smaller fans. Really nice job with this fan. Beautiful results and thank you for posting your restoration. Congratulations and I hope you get years of enjoyment out this this wonderful fan. Thank you, Mel. 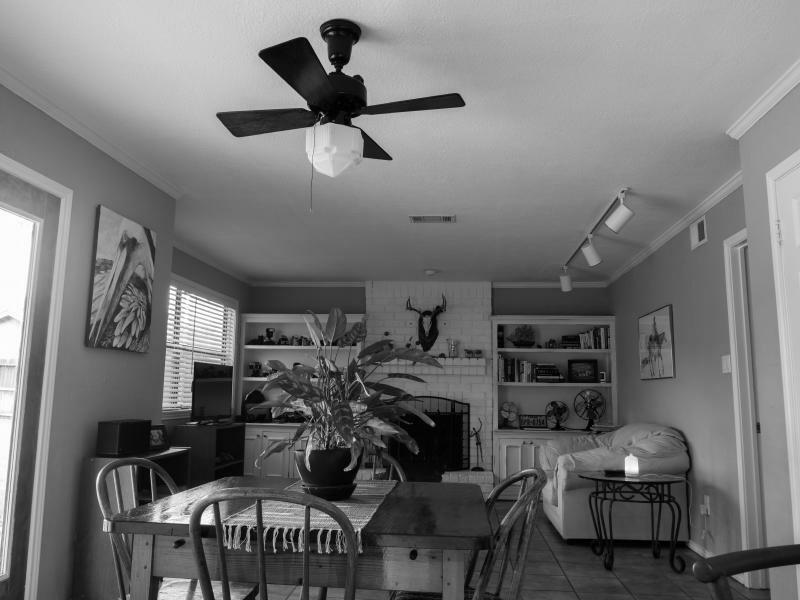 I am very pleased with how this fan turned out and it should present very well in my breakfast room back in Texas. It'll probably get more visual exposure than any other fan in my house. My next restoration will be a 1931 Emerson 69641 36" nonreversible Roundnose w/ fixed 4" globe fitter... yes, one of the infamous Medical Arts Building fans! 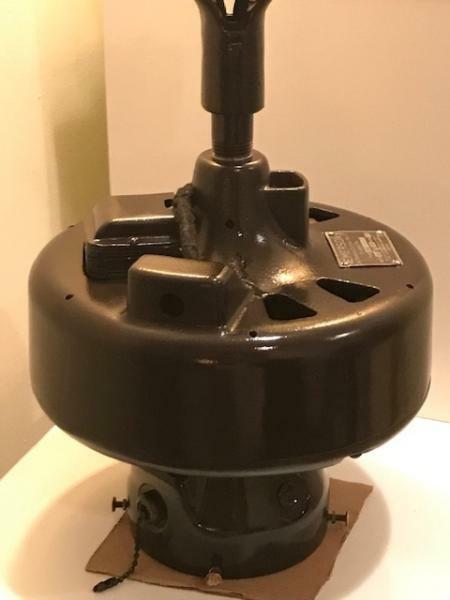 I am restoring it for my dad's study back in New Braunfels, TX in satin black to match the late '20s Emerson 45641 Longnose fan I restored and hung in the living room. 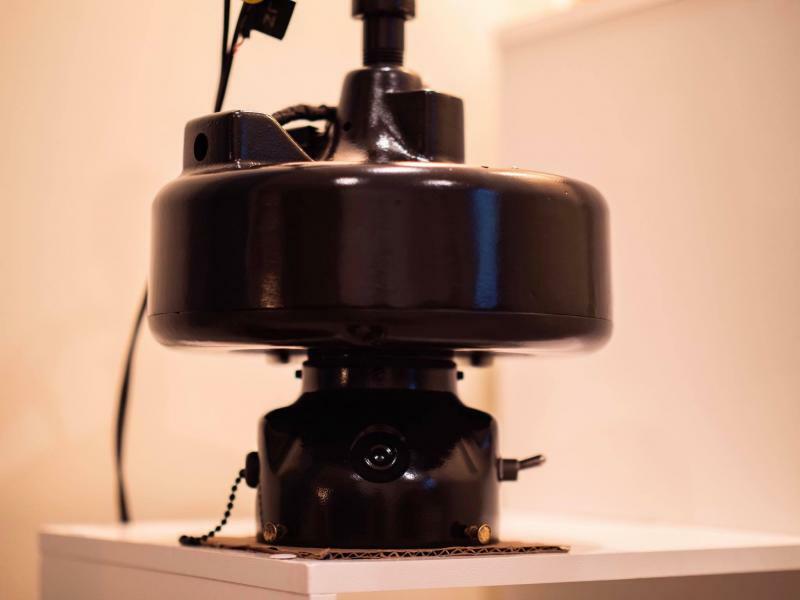 If anyone here is on Instagram, I occasionally post fan restoration pics along with my usual landscape and portrait photography. Feel free to follow me @dwarnecke11. Quick update: Mounted the blades to the rotor and balanced them out - the irons were badly bent but straightened out just fine. The motor indeed reverses itself while running with blades mounted. The drag of the blades is enough to allow this to happen when the switch is flipped to engage the opposite set of shading coils. Quick video of it running on a "low" provided by an 8uF capacitor. Up and running great. 8.5uF capacitor gives it about a 110 rpm low, silent with a bit of air movement when sitting at the breakfast table. High speed flies, and the motor makes a nice wind up sound. Page processed in 0.1828 seconds (20% database + 80% PHP). 30 queries executed.